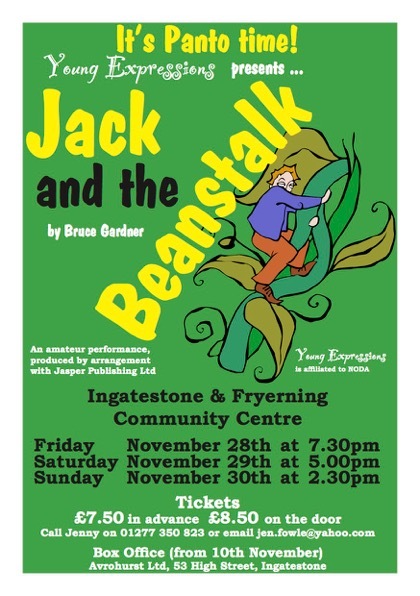 I always enjoy watching young people perform and the cast of this pantomime made it a very enjoyable afternoon. The audience were appreciative and enthusiastic and I am sure that made the cast perform even better. Jared Bates made a terrific Dame Trot, keeping the show moving and playing this traditional pantomime role with just the right amount of comedy. Pippa Bates (Woody) has great stage presence in this traditionally supporting role. Megan Greenwood (Jack Trot) and Melina Angeli (Sally Snatchett) made a lovely pairing and well done to Melina who carried on with the role despite being quite ill. I would not have known if I hadn’t been told, a true professional attitude. I must, particularly, commend James Ravenscroft for his performance as the mean and miserly Grippen Snatchett. I am sure that he has a future in performing; his confidence and performance were outstanding. Ella Fowler and Sienna Doyle were lovely as Daisy the cow, although I (and I suspect the rest of the audience) would have liked to see their faces for the walkdown. The remaining principals Tyler Payne (Sidney Banewort) Grant Clark (Bumbledore) Georgia Bennett (Harp) and Isabella Abraham (Golden Hen) all performed well. I would, however particularly like to praise the ensemble; many of these young people were onstage for the first time and, although not all of them spoke their lines loudly enough, we were happy to forgive this because they were clearly having a great time. With a little more experience I am sure we will be seeing some of them in Principal roles before long. The scenery was excellent, simple but very effective and the costumes were also excellent. It was a largish cast for this small stage (27, I think!) and it must have been crowded but fun back stage. The audience were very appreciative and it was lovely to be part of that enthusiasm. It is lovely to see the group so well supported; long may Young Expressions continue to provide such excellent opportunities for young people to enjoy performing. I look forward to their next production. Jack is a young boy living with his widowed mother and a milk cow who is their only source of income. When the cow stops giving milk, Jack's mother has him take her to the market to be sold. On the way, he meets an old man who offers "magic beans" in exchange for the cow and Jack makes the trade. When he arrives home without any money, his mother becomes furious, throws the beans to the ground and sends Jack to bed. Jack is hidden by the giant's wife and he overhears the giant counting money. When the giant sleeps, he steals a bag of gold coins and makes his escape down the beanstalk. Jack returns up the beanstalk twice more. Each time he is helped by the wife, although she grows increasingly suspicious of him. He learns of other treasures and steals them when the giant sleeps: first a goose that lays golden eggs (the most common variant is a hen; compare the idiom "to kill the goose that laid the golden eggs. "), then a harp that plays by itself. However, the giant is woken when Jack leaves the house with the harp. The giant chases him down the beanstalk and Jack calls to his mother for an axe. Before the giant reaches the ground, Jack cuts down the beanstalk, causing the giant to fall to his death. Jack and his mother then live happily ever after with their riches that Jack stole from the giant.